In building regulation speak -another letter down the alphabet with the publication of a new draft section of the Approved Documents- Part R which has recently been published by the Government for industry consultation. Like the other electrical element to the regulations Part P- Electrical Safety, the new document also only has one requirement- R1– To ensure that buildings have the ability to connect to high speed communication. Alternately in rural areas where no infrastructure is currently present- hardwired connection present for the ability to connect when services arrive. 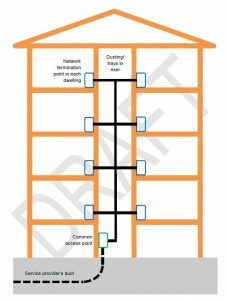 The driver behind this new Part of the Building Regulations is a European Directive set in 2014 to reduce the cost of deploying high-speed electronic communication networks in buildings. At present the target date for the new regulations coming into force will be from the 1st January 2017 for projects submitted to building control inspectors needing to comply with the additional requirements that the document brings. This requirement will apply only to new buildings so renovation and refurbishment work of existing dwellings would not trigger the requirement, however buildings subject to ‘major renovation works’ will. The definition of ‘Major Renovation’ is as follows: ‘Works at the end-user’s location encompassing structural modifications of the entire in-building physical infrastructure, or of a significant part of it’. Therefore conversions of existing building to residential use or multiple dwellings created from a single dwelling could well fall under the regulations. From the draft consultation it would appear the requirements are not too onerous, with the specification required being only that of a current high quality build. Diagram from the Draft Consultation for multi storey occupation. The main concern for the industry which requires a level of thought and specification is for multi storey occupancy where central ducting needs to ensure all parts of the building can access the same degree of speed of access to communications. It would therefore appear that Part R is another building regulation that whilst does not greatly change the approach to design or construction is another requirement which requires care and consideration of services to ensure compliance. Further details will become apparent during the consultation and how building control inspectors will view the regulations for conversion works. Andrew Beeston is a Chartered Architectural Technologist (CIAT) and has over 15 years of experience working on new build, conservation and conversion projects. Next Post What will Brexit mean for property investors?